Hillsboro, OR (March 3, 2016) – The Hillsboro Hops and BridgePort Brewing Company announced today that they have extended their partnership. 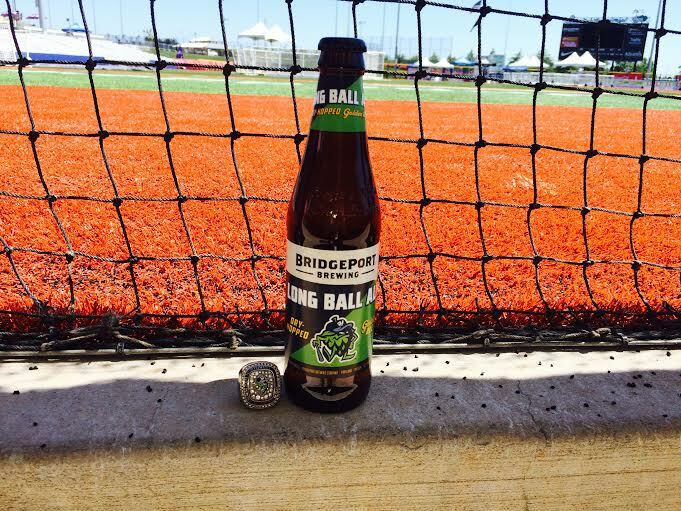 BridgePort will continue to produce the award-winning Hillsboro Hops special brew known as “Long Ball Ale”. The popular brew is available at Ron Tonkin Field during Hillsboro Hops home games, at BridgePort Brewing’s BrewPub located in the Pearl District of Portland, on-tap at select bars and restaurants, and at select grocery stores in Oregon, Washington and Idaho. The BridgePort Brewing partnership also includes BridgePort brands featured throughout Ron Tokin Field through signage and logos. An official BridgePort Beer Garden located off of the first base line will continue to offer access to food, craft beer and a great view of the field. Long Ball Ale won gold in the English-Style Gold Ale/Summer Ale category at last year’s European Beer Star Awards held in Doemens Brewing Academy in Gräfelfing, near Munich, Germany. Long Ball Ale, dry-hopped with Meridian hops from Willamette Valley, is a golden ale with refreshing lemon notes crafted by Brewmaster Jeff Edgerton. The European Beer Star Awards is considered the Champions League of the international brewery world. The back-to-back defending champion Hillsboro Hops will host their home opener at Ron Tonkin Field on Monday, June 20th against the Eugene Emeralds. 2016 season tickets and mini plans are on sale now by calling the Hillsboro front office at (503) 640-0887 or online at www.hillsborohops.com. The 2014 & 2015 Northwest League Champion Hillsboro Hops are the Single-A baseball affiliate of the Arizona Diamondbacks of Major League Baseball. The team’s season runs from mid-June to early September. The franchise relocated to Hillsboro in 2012 and began play in 2013 in a new state-of-the-art 4,500 capacity ballpark, Ron Tonkin Field. The Hops are part of the 58-year old Northwest League, which includes teams in Boise, Eugene, Salem-Keizer, Tri-Cities, Spokane, Everett and Vancouver BC. Major League stars who rose to prominence via the Northwest League include Ken Griffey Jr., Felix Hernandez, Edgar Martinez, Reggie Jackson, Ozzie Smith, Rickey Henderson and Tony Gwynn. Follow the Hops on Facebook at www.facebook.com/HillsboroHops and on Twitter, Instagram and Snapchat @HillsboroHops. Oregon's oldest craft brewery continues to evolve from a microbrewery to a regional leader committed to producing high quality craft ales. Lead by Brewmaster Jeff Edgerton, the team of BridgePort brewers prides itself on using local hops and clear glacial water from Mount Hood. The BridgePort family of ales includes the STUMPTOWN Series, BridgePort IPA, Hop Czar Imperial IPA, Kingpin, and seasonal offerings. BridgePort Brewery is located at 1313 N.W. Marshall. For more information or visit www.bridgeportbrew.com.